Hop aboard this Old West train in Calico Square and take in the sights and sounds of the Wild West, including live Bandits!! A humorous and historic attraction, the Calico Railroad is a very historic train, built in 1881 and brought to Knott's in 1952. This train features real C-19 engines and has been restored to look exactly the way it originally did on Colorado's Rio Grande Southern and Denver & Rio Grande Western Railroads. Knott's uses engines #340 and #41 on their trains. 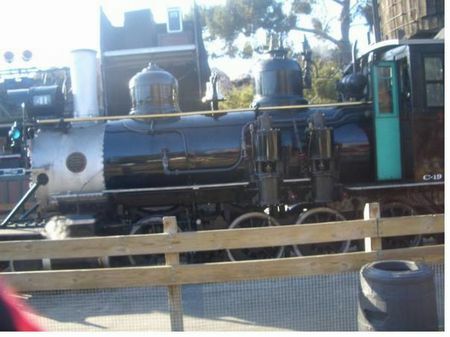 Unlike those of other theme parks, the Calico Railroad drops off passengers at the same place they boarded; it is not a transportation ride.